All the feedback and data I have on Stephan was given by Tatiana Alakseeva. If you have any more information you would like to share please contact Daniela Barros. Nobody knows why he was entered as EUR in pawpeds, it is not like he was really coming from Europe. He should have been entered a XSH. He was not exactly short hair either but fur wasn’t like Sib fur and not as long. He was just a foundation from Losiny Ostrov area like a street cat taken there. 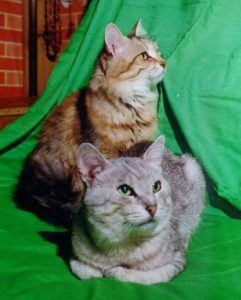 Elena Svishcheva, from Losiny Ostrov cattery had a nice golden female, Bukaschka, that did not want to mate with any male other than Stephan and they used him. They had two kittens in 1994:Bask iz Losinogo Ostrova and Batist iz Losinogo Ostrova. Several people wonder how to position a cat with Stephan in a group. Since Stephan is basically a “X” cat meaning unknown but not a colourpoint, not a nem and not even really an Eur SH, the questions is not relevant regarding the groups.